Palm oil is naturally reddish in color because of a high beta-carotene content. It is not to be confused with palm kernel oil derived from the kernel of the same fruit or coconut oil derived from the kernel of the coconut palm (Cocos nucifera). The differences are in color (raw palm kernel oil lacks carotenoids and is not red), and in saturated fat content: palm mesocarp oil is 49% saturated, while palm kernel oil and coconut oil are 81% and 86% saturated fats, respectively. However, crude red palm oil that has been refined, bleached and deodorized, a common commodity called RBD palm oil, does not contain carotenoids. The use of palm oil in food products has attracted the concern of environmental activist groups; the high oil yield of the trees has encouraged wider cultivation, leading to the clearing of forests in parts of Indonesia to make space for oil-palm monoculture. This has resulted in significant acreage losses of the natural habitat of the three surviving species of orangutan. One species in particular, the Sumatran orangutan, has been listed as critically endangered. In 2004, an industry group called the Roundtable on Sustainable Palm Oil was formed to work with the palm oil industry to address these concerns. Additionally, in 1992, in response to concerns about deforestation, the Government of Malaysia pledged to limit the expansion of palm oil plantations by retaining a minimum of half the nation's land as forest cover. Humans used oil palms as far as 5,000 years back; in the late–1800s, archaeologists discovered a substance that they concluded was originally palm oil in a tomb at Abydos dating back to 3,000 BCE. It is believed that traders brought oil palm to Egypt. Palm oil from E. guineensiss has long been recognized in West and Central African countries, and is widely used as a cooking oil. European merchants trading with West Africa occasionally purchased palm oil for use as a cooking oil in Europe. By around 1870, palm oil constituted the primary export of some West African countries, such as Ghana and Nigeria, although this was overtaken by cocoa in the 1880s. Palm oil, like all fats, is composed of fatty acids, esterified with glycerol. Palm oil has an especially high concentration of saturated fat, specifically the 16-carbon saturated fatty acid, palmitic acid, to which it gives its name. Monounsaturated oleic acid is also a major constituent of palm oil. Unrefined palm oil is a significant source of tocotrienol, part of the vitamin E family. Many processed foods either contain palm oil or various ingredients made from it. After milling, various palm oil products are made using refining processes. First is fractionation, with crystallization and separation processes to obtain solid (stearin), and liquid (olein) fractions. Then melting and degumming removes impurities. Then the oil is filtered and bleached. Physical refining[clarification needed] removes smells and coloration to produce "refined, bleached and deodorized palm oil" (RBDPO) and free fatty acids,[clarification needed] which are used in the manufacture of soaps, washing powder and other products. RBDPO is the basic palm oil product sold on the world's commodity markets. Many companies fractionate it further to produce palm oil for cooking oil, or process it into other products. White palm oil is the result of processing and refining. When refined, the palm oil loses its deep red color. It is extensively used in food manufacture and can be found in a variety of processed foods including peanut butter and chips. 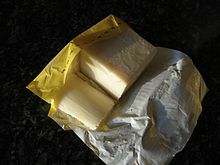 It is often labeled as palm shortening and is used as a replacement ingredient for hydrogenated fats in a variety of baked and fried products. The highly saturated nature of palm oil renders it solid at room temperature in temperate regions, making it a cheap substitute for butter or hydrogenation vegetable oils in uses where solid fat is desirable, such as the making of pastry dough and baked goods. The health concerns related to trans fats in hydrogenated vegetable oils may have contributed to the increasing use of palm oil in the food industry. Palm oil is also used in animal feed. In March 2017, a documentary made by Deutsche Welle revealed that palm oil is used to make milk substitutes to feed calves in dairies in the German alps. These milk substitutes contain 30% milk powder and the remainder of raw protein made from skimmed milk powder, whey powder, and vegetable fats, mostly coconut oil and palm oil. Palm oil is used to produce both methyl ester and hydrodeoxygenated biodiesel. Palm oil methyl ester is created through a process called transesterification. Palm oil biodiesel is often blended with other fuels to create palm oil biodiesel blends. Palm oil biodiesel meets the European EN 14214 standard for biodiesels. Hydrodeoxygenated biodiesel is produced by direct hydrogenolysis of the fat into alkanes and propane. The world's largest palm oil biodiesel plant is the €550 million Finnish-operated Neste Oil biodiesel plant in Singapore, which opened in 2011 with a capacity of 800,000 tons per year and produces hydrodeoxygenated NEXBTL biodiesel from palm oil imported from Malaysia and Indonesia. Significant amounts of palm oil exports to Europe are converted to biodiesel (as of early 2018: Indonesia: 40%, Malaysia 30%).. In 2014, almost half of all the palm oil in Europe was burnt as car and truck fuel. As of 2018, one-half of Europe's palm oil imports were used for biodiesel. Use of palm oil as biodiesel generates three times the carbon emissions as using fossil fuel, and, for example, "biodiesel made from Indonesian palm oil makes the global carbon problem worse, not better." In 2016, the global production of palm oil was estimated at 62.6 million tonnes, 2.7 million tonnes more than in 2015. The palm oil production value was estimated at $US39.3 billion in 2016, a increase of $US2.4 billion (or +7%) against the production figure recorded in the previous year. Between 1962 and 1982 global exports of palm oil increased from around half a million to 2.4 million tonnes annually and in 2008 world production of palm oil and palm kernel oil amounted to 48 million tonnes. According to FAO forecasts by 2020 the global demand for palm oil will double, and triple by 2050. Indonesia is the world's largest producer of palm oil, surpassing Malaysia in 2006, producing more than 20.9 million tonnes. Indonesia expects to double production by the end of 2030. At the end of 2010, 60% of the output was exported in the form of crude palm oil. FAO data show production increased by over 400% between 1994 and 2004, to over 8.66 million metric tonnes. In 2012, Malaysia, the world's second largest producer of palm oil, produced 18.79 million tonnes of crude palm oil on roughly 5,000,000 hectares (19,000 sq mi) of land. Though Indonesia produces more palm oil, Malaysia is the world's largest exporter of palm oil having exported 18 million tonnes of palm oil products in 2011. China, Pakistan, the European Union, India and the United States are the primary importers of Malaysian palm oil products. As of 2011, Nigeria was the third-largest producer, with approximately 2.3 million hectares (5.7×10^6 acres) under cultivation. Until 1934, Nigeria had been the world's largest producer. Both small- and large-scale producers participated in the industry. Thailand is the world's third largest producer of crude palm oil, producing approximately two million tonnes per year, or 1.2% of global output. Nearly all of Thai production is consumed locally. Almost 85% of palm plantations and extraction mills are in south Thailand. At year-end 2016, 4.7 to 5.8 million rai were planted in oil palms, employing 300,000 farmers, mostly on small landholdings of 20 rai. ASEAN as a region accounts for 52.5 million tonnes of palm oil production, about 85% of the world total and more than 90% of global exports. Indonesia accounts for 52.2% of world exports. Malaysian exports total 37.9%. The biggest consumers of palm oil are India, the European Union, and China, with the three consuming nearly 50% of world exports. Thailand's Department of Internal Trade (DIT) usually sets the price of crude palm oil and refined palm oil. Thai farmers have a relatively low yield compared to those in Malaysia and Indonesia. Thai palm oil crops yield 4–17% oil compared to around 20% in competing countries. In addition, Indonesian and Malaysian oil palm plantations are 10 times the size of Thai plantations. In the 1960s, about 18,000 hectares (69 sq mi) were planted with palm. Colombia has now become the largest palm oil producer in the Americas, and 35% of its product is exported as biofuel. In 2006, the Colombian plantation owners' association, Fedepalma, reported that oil palm cultivation was expanding to 1,000,000 hectares (3,900 sq mi). This expansion is being funded, in part, by the United States Agency for International Development to resettle disarmed paramilitary members on arable land, and by the Colombian government, which proposes to expand land use for exportable cash crops to 7,000,000 hectares (27,000 sq mi) by 2020, including oil palms. Fedepalma states that its members are following sustainable guidelines. Cameroon had a production project underway initiated by Herakles Farms in the US. However, the project was halted under the pressure of civil society organizations in Cameroon. Before the project was halted, Herakles left the Roundtable on Sustainable Palm Oil early in negotiations. The project has been controversial due to opposition from villagers and the location of the project in a sensitive region for biodiversity. Kenya's domestic production of edible oils covers about a third of its annual demand, estimated at around 380,000 tonnes. The rest is imported at a cost of around US$140 million a year, making edible oil the country's second most important import after petroleum. Since 1993 a new hybrid variety of cold-tolerant, high-yielding oil palm has been promoted by the Food and Agriculture Organization of the United Nations in western Kenya. As well as alleviating the country's deficit of edible oils while providing an important cash crop, it is claimed to have environmental benefits in the region, because it does not compete against food crops or native vegetation and it provides stabilisation for the soil. In Borneo, the forest (F), is being replaced by oil palm plantations (G). These changes are irreversible for all practical purposes (H). The use of palm oil in the production of biodiesel has led to concerns that the need for fuel is being placed ahead of the need for food, leading to malnutrition in developing nations. This is known as the food versus fuel debate. According to a 2008 report published in the Renewable and Sustainable Energy Reviews, palm oil was determined to be a sustainable source of both food and biofuel. The production of palm oil biodiesel does not pose a threat to edible palm oil supplies. According to a 2009 study published in the Environmental Science and Policy journal, palm oil biodiesel might increase the demand for palm oil in the future, resulting in the expansion of palm oil production, and therefore an increased supply of food. Palm oil cultivation has been criticized for impacts on the natural environment, including deforestation, loss of natural habitats, which has threatened critically endangered species such as the orangutan and Sumatran tiger, as well as increased greenhouse gas emissions. Many palm oil plantations are built on top of existing peat bogs, and clearing the land for palm oil cultivation contributes to rising greenhouse-gas emissions. Efforts to portray palm oil cultivation as sustainable have been made by organizations including the Roundtable on Sustainable Palm Oil, an industry lobby group, as well as the Malaysian government, which has committed to preserve 50% of its total land area as forest. While only 5% of the world's vegetable oil farmland is used for palm plantations, palm cultivation produces 38% of the world's total vegetable oil supply. In terms of oil yield, a palm plantation is 10 times more productive than soya bean and rapeseed cultivation because the palm fruit and kernel both provide usable oil. A 2018 study by the International Union for Conservation of Nature (IUCN) concluded that palm oil is "here to stay" as its cultivation is nine times more productive per unit of land compared with other vegetable oils. IUCN maintains that replacing palm oil with other vegetable oils would lead to greater land spoilage, adding to biodiversity deterioration. The Roundtable on Sustainable Palm Oil (RSPO) was created as a lobby group by industry in 2004 following concerns raised by non-governmental organizations about environmental impacts related to palm oil production. The organization has established international standards for sustainable palm oil production. Products containing Certified Sustainable Palm Oil (CSPO) can carry the RSPO trademark. Members of the RSPO include palm oil producers, environmental groups, and manufacturers who use palm oil in their products. According to the Hamburg-based Oil World trade journal, in 2008 global production of oils and fats stood at 160 million tonnes. Palm oil and palm kernel oil were jointly the largest contributor, accounting for 48 million tonnes, or 30% of the total output. Soybean oil came in second with 37 million tonnes (23%). About 38% of the oils and fats produced in the world were shipped across oceans. Of the 60 million tonnes of oils and fats exported around the world, palm oil and palm kernel oil made up close to 60%; Malaysia, with 45%of the market share, dominated the palm oil trade. Previously, palm oil could be listed as "vegetable fat" or "vegetable oil" on food labels in the European Union (EU). From December 2014, food packaging in the EU is no longer allowed to use the generic terms "vegetable fat" or "vegetable oil" in the ingredients list. Food producers are required to list the specific type of vegetable fat used, including palm oil. Vegetable oils and fats can be grouped together in the ingredients list under the term "vegetable oils" or "vegetable fats" but this must be followed by the type of vegetable origin (e.g., palm, sunflower, or rapeseed) and the phrase "in varying proportions". The Roundtable on Sustainable Palm Oil (RSPO) was established in 2004 following concerns raised by non-governmental organizations about environmental impacts resulting from palm oil production. The organization has established international standards for sustainable palm oil production. Products containing Certified Sustainable Palm Oil (CSPO) can carry the RSPO trademark. Members of the RSPO include palm oil producers, environmental groups, and manufacturers who use palm oil in their products. The RSPO is applying different types of programmes to supply palm oil to producers. GreenPalm is one of the retailers executing the book and claim supply chain and trading programme. It guarantees that the palm oil producer is certified by the RSPO. Through GreenPalm the producer can certify a specified amount with the GreenPalm logo. The buyer of the oil is allowed to use the RSPO and the GreenPalm label for sustainable palm oil on their products. Contributing significant calories as a source of fat, palm oil is a food staple in many cuisines. On average globally, humans consumed 17 pounds (7.7 kg) of palm oil per person in 2015. Although the relationship of palm oil consumption to disease risk has been previously assessed, the quality of the clinical research specifically assessing palm oil effects has been generally poor. Consequently, research has focused on the deleterious effects of palm oil and palmitic acid consumption as sources of saturated fat content in edible oils, leading to conclusions that palm oil and saturated fats should be replaced with polyunsaturated fats in the diet. Excessive intake of palmitic acid, which makes up 44% of palm oil, increases blood levels of low-density lipoprotein and total cholesterol, and so increases risk of cardiovascular diseases. Other reviews, the World Health Organization, and the US National Heart, Lung and Blood Institute have encouraged consumers to limit the consumption of palm oil, palmitic acid and foods high in saturated fat. Wikimedia Commons has media related to Palm oil. ^ Reeves, James B.; Weihrauch, John L; Consumer and Food Economics Institute (1979). Composition of foods: fats and oils. Agriculture handbook 8-4. Washington, D.C.: U.S. Dept. of Agriculture, Science and Education Administration. p. 4. OCLC 5301713. ^ a b c Nagendran, B.; Unnithan, U. R.; Choo, Y. M.; Sundram, Kalyana (2000). "Characteristics of red palm oil, a carotene- and vitamin E–rich refined oil for food uses". Food and Nutrition Bulletin. 21 (2): 77–82. doi:10.1177/156482650002100213. ^ "FAO data - dimension-member - Oil, palm fruit". ref.data.fao.org. Retrieved 2018-08-17. ^ Behrman, E. J.; Gopalan, Venkat (2005). William M. Scovell, ed. "Cholesterol and Plants" (PDF). Journal of Chemical Education. 82 (12): 1791. Bibcode:2005JChEd..82.1791B. doi:10.1021/ed082p1791. Archived (PDF) from the original on 21 October 2012. ^ "Palm Oil Continues to Dominate Global Consumption in 2006/07" (PDF) (Press release). United States Department of Agriculture. June 2006. Archived from the original (PDF) on 19 October 2012. Retrieved 22 September 2009. ^ a b Raghu, Anuradha (17 May 2017). "We Each Consume 17 Pounds of Palm Oil a Year". Bloomberg News. Archived from the original on 17 May 2017. Retrieved 22 May 2017. ^ "Deforestation". www.sustainablepalmoil.org. Archived from the original on 17 August 2016. Retrieved 15 June 2016. ^ a b Natasha Gilbert (4 July 2012). "Palm-oil boom raises conservation concerns: Industry urged towards sustainable farming practices as rising demand drives deforestation". Nature. 487 (7405): 14–15. doi:10.1038/487014a. PMID 22763524. Archived from the original on 7 July 2012. ^ a b Morales, Alex (18 November 2010). "Malaysia Has Little Room for Expanding Palm-Oil Production, Minister Says". Bloomberg. Archived from the original on 12 September 2012. Retrieved 1 March 2013. ^ Scott-Thomas, Caroline (17 September 2012). "French firms urged to back away from 'no palm oil' label claims". Foodnavigator. Archived from the original on 12 March 2013. Retrieved 7 March 2013. ^ Kiple, Kenneth F.; Conee Ornelas, Kriemhild, eds. (2000). The Cambridge World History of Food. Cambridge University Press. ISBN 978-0521402163. Archived from the original on 20 October 2012. Retrieved 30 August 2012. ^ Obahiagbon, F.I. (2012). "A Review: Aspects of the African Oil Palm (Elaeis guineesis Jacq.)" (PDF). American Journal of Biochemistry and Molecular Biology. 2 (3): 1–14. doi:10.3923/ajbmb.2012.106.119. Archived (PDF) from the original on 16 January 2013. Retrieved 30 August 2012. ^ "British Colonial Policies and the Oil Palm Industry in the Niger Delta Region of Nigeria, 1900–1960" (PDF). African Study Monographs. 21 (1): 19–33. 2000. Archived (PDF) from the original on 16 January 2013. ^ Ahsan H, Ahad A, Siddiqui WA (2015). "A review of characterization of tocotrienols from plant oils and foods". J Chem Biol. 8 (2): 45–59. doi:10.1007/s12154-014-0127-8. PMC 4392014. PMID 25870713. ^ "Oil, vegetable, palm per 100 g; Fats and fatty acids". Conde Nast for the USDA National Nutrient Database, Release SR-21. 2014. Archived from the original on 28 October 2016. Retrieved 28 October 2016. ^ Ng, M. H.; Choo, Y. M. (2016). "Improved Method for the Qualitative Analyses of Palm Oil Carotenes Using UPLC". Journal of Chromatographic Science. 54 (4): 633–638. doi:10.1093/chromsci/bmv241. PMC 4885407. PMID 26941414. ^ "Palm oil products and the weekly shop". BBC Panorama. 22 February 2010. Archived from the original on 25 February 2010. Retrieved 22 February 2010. ^ a b "Investment in Technology". PT. Asianagro Agungjaya. Archived from the original on 17 December 2007. ^ "Palm Oil In The Food Supply: What You Should Know". NPR.org. 25 July 2013. Retrieved 2 December 2018. ^ "Too much milk in Europe (Interview with Sprayfo)". Deutsche Welle. 25 March 2017. ^ a b Rojas, Mauricio (3 August 2007). "Assessing the Engine Performance of Palm Oil Biodiesel". Biodiesel Magazine. Archived from the original on 11 May 2013. Retrieved 25 February 2013. ^ Yahya, Yasmine (9 March 2011). "World's Largest Biodiesel Plant Opens in Singapore". The Jakarta Globe. Archived from the original on 26 June 2012. Retrieved 25 February 2013. ^ hermes (24 January 2018). "European ban on palm oil in biofuels upsets Jakarta, KL". The Straits Times. ^ Wahyudi Soeriaatmadja; Trinna Leong (24 January 2018). "European ban on palm oil in biofuels upsets Jakarta, KL". The Straits Times. Retrieved 23 November 2018. For Indonesia, 40% of its palm oil exports to Europe are converted into biofuels. Europe is Malaysia's second-largest export market for palm oil, with 30% of it used for biodiesel. ^ Robert-Jan Bartunek; Alissa de Carbonnel (14 June 2018). "EU to phase out palm oil from transport fuel by 2030". Reuters. Retrieved 23 November 2018. Half of the EU’s 6 billion euros ($7 billion) worth of palm oil imports are used for biodiesel, according to data from Copenhagen Economics. ^ Hans Spross (22 June 2018). "Does EU biofuel deal compromise the environment for trade with Southeast Asia?". Deutsche Welle. Retrieved 23 November 2018. According to a 2015 study carried out on behalf of the European Commission, the production and use of palm oil biodiesel causes three times the carbon emissions of fossil diesel. ^ Loh Soh Kheang; Choo Yuen May; Cheng Sit Food; Ma Ah Ngan (18 June 2006). Recovery and conversion of palm olein-derived used frying oil to methyl esters for biodiesel (PDF). Journal of Palm Oil Research (Report). Archived (PDF) from the original on 4 July 2010. Retrieved 25 February 2013. ^ "Global Palm Oil Market Overview - 2018 - IndexBox". www.indexbox.io. Retrieved 2018-08-17. ^ Prokurat, Sergiusz (2013). "Palm oil - strategic source of renewable energy in Indonesia and Malaysia" (PDF). Journal of Modern Science: 425–443. Archived from the original (PDF) on 4 March 2016. ^ "P&G may build oleochemical plant to secure future supply". The Jakarta Post. 24 May 2011. Archived from the original on 25 July 2012. Retrieved 15 June 2012. ^ Pakiam, Ranjeetha (3 January 2013). "Palm Oil Advances as Malaysia's Export Tax May Boost Shipments". Bloomberg. Archived from the original on 5 January 2013. Retrieved 29 January 2013. ^ "MPOB expects CPO production to increase to 19 million tonnes this year". The Star Online. 15 January 2013. Archived from the original on 27 January 2013. Retrieved 29 January 2013. ^ "MALAYSIA: Stagnating Palm Oil Yields Impede Growth". USDA Foreign Agricultural Service. 11 December 2012. Archived from the original on 18 February 2013. Retrieved 29 January 2013. ^ May, Choo Yuen (September 2012). "Malaysia: economic transformation advances oil palm industry". American Oil Chemists' Society. Archived from the original on 13 November 2012. Retrieved 29 January 2013. ^ Ayodele, Thompson (August 2010). "African Case Study: Palm Oil and Economic Development in Nigeria and Ghana; Recommendations for the World Bank's 2010 Palm Oil Strategy" (PDF). Initiative For Public Policy Analysis. Archived from the original (PDF) on 22 April 2012. Retrieved 8 December 2011. ^ Ayodele, Thompson (15 October 2010). "The World Bank's Palm Oil Mistake". The New York Times. Archived from the original on 19 January 2018. Retrieved 8 December 2011. ^ Arunmas, Phusadee; Wipatayotin, Apinya (28 January 2018). "EU move fuelling unease among palm oil producers" (Spectrum). Bangkok Post. Retrieved 29 January 2018. ^ Bacon, David (18 July 2007). "Blood on the Palms: Afro-Colombians fight new plantations". Archived from the original on 19 October 2012. See also "Unfulfilled Promises and Persistent Obstacles to the Realization of the Rights of Afro-Colombians,"  A Report on the Development of Ley 70 of 1993 by the Repoport Center for Human Rights and Justice, Univ. of Texas at Austin, Jul 2007. ^ Pazos, Flavio (3 August 2007). "Benin: Large scale oil palm plantations for agrofuel". World Rainforest Movement. Archived from the original on 8 August 2014. ^ African Biodiversity Network (2007). Agrofuels in Africa: the impacts on land, food and forests: case studies from Benin, Tanzania, Uganda and Zambia. translated by. African Biodiversity Network. Archived from the original on 18 April 2016. ^ "Cameroon changes mind on Herakles palm oil project". World Wildlife Fund. 21 June 2013. Archived from the original on 13 December 2013. Retrieved 23 May 2016. ^ "Hybrid oil palms bear fruit in western Kenya". UN FAO. 24 November 2003. Archived from the original on 22 January 2015. ^ Budidarsono, Suseno; Dewi, Sonya; Sofiyuddin, Muhammad; Rahmanulloh, Arif. "Socio-Economic Impact Assessment of Palm Oil Production" (PDF). World Agroforestry Centre. Archived (PDF) from the original on 11 January 2014. Retrieved 30 January 2013. ^ Norwana, Awang Ali Bema Dayang; Kunjappan, Rejani (2011). "The local impacts of oil palm expansion in Malaysia" (PDF). cifor.org. Center for International Forestry Research. Archived (PDF) from the original on 22 June 2013. Retrieved 30 January 2013. ^ Ismail, Saidi Isham (9 November 2012). "Palm oil transforms economic landscape". Business Times. Archived from the original on 12 November 2012. Retrieved 30 January 2013. ^ "Palm oil cultivation for biofuel blocks return of displaced people in Colombia" (PDF) (Press release). Internal Displacement Monitoring Centre. 5 November 2007. Archived from the original (PDF) on 27 November 2007. Retrieved 30 January 2013. ^ Colchester, Marcus; Jalong, Thomas; Meng Chuo, Wong (2 October 2012). "Free, Prior and Informed Consent in the Palm Oil Sector – Sarawak: IOI-Pelita and the community of Long Teran Kanan". Forest Peoples Program. Archived from the original on 14 May 2013. Retrieved 30 January 2013. ^ ""Losing Ground" – report on indigenous communities and oil palm development from LifeMosaic, Sawit Watch and Friends of the Earth". Forest Peoples Programme. 28 February 2008. Archived from the original on 14 May 2013. Retrieved 30 January 2013. ^ Indonesian migrant workers: with particular reference in the oil palm plantation industries in Sabah, Malaysia. Biomass Society (Report). Center for Southeast Asian Studies, Kyoto University. 11 December 2010. Archived from the original on 11 January 2014. ^ "Malaysia Plans High-Tech Card for Foreign Workers". ABC News. 9 January 2014. Archived from the original on 13 January 2014. ^ "Malaysia rounds up thousands of migrant workers". BBC News. 2 September 2013. Archived from the original on 5 September 2013. ^ Ibrahim, Ahmad (31 December 2012). "Felcra a success story in rural transformation". New Straits Times. Archived from the original on 13 April 2013. Retrieved 7 February 2013. ^ Man Kee Kam; Kok Tat Tan; Keat Teong Lee; Abdul Rahman Mohamed (9 September 2008). Malaysian Palm oil: Surviving the food versus fuel dispute for a sustainable future. Renewable and Sustainable Energy Reviews (Report). Retrieved 26 February 2013. ^ Corley, R. H. V. (2009). "How much palm oil do we need?". Environmental Science & Policy. 12 (2): 134–838. doi:10.1016/j.envsci.2008.10.011. ^ a b "Palm oil: Cooking the Climate". Greenpeace. 8 November 2007. Archived from the original on 10 April 2010. Retrieved 30 January 2013. ^ "The bird communities of oil palm and rubber plantations in Thailand" (PDF). The Royal Society for the Protection of Birds (RSPB). Archived (PDF) from the original on 6 October 2016. Retrieved 4 October 2016. ^ "Palm oil threatening endangered species" (PDF). Center for Science in the Public Interest. May 2005. Archived (PDF) from the original on 17 September 2012. ^ Shears, Richard (30 March 2012). "Hundreds of orangutans killed in north Indonesian forest fires deliberately started by palm oil firms". Daily Mail. London. Archived from the original on 20 April 2013. Retrieved 1 April 2012. ^ "Camera catches bulldozer destroying Sumatra tiger forest". World Wildlife Fund. 12 October 2010. Archived from the original on 16 January 2013. Retrieved 30 January 2013. ^ a b Foster, Joanna M. (1 May 2012). "A Grim Portrait of Palm Oil Emissions". The New York Times. Archived from the original on 16 January 2013. Retrieved 30 January 2013. ^ Yui, Sahoko; Yeh, Sonia (2013-12-01). "Land use change emissions from oil palm expansion in Pará, Brazil depend on proper policy enforcement on deforested lands". Environmental Research Letters. 8 (4): 044031. doi:10.1088/1748-9326/8/4/044031. ISSN 1748-9326. ^ "Researchers warn against high emissions from oil palm expansion in Brazil". phys.org. November 13, 2013. Retrieved 2019-04-10. ^ a b Rosenthal, Elisabeth (31 January 2007). "Once a Dream Fuel, Palm Oil May Be an Eco-Nightmare". The New York Times. Archived from the original on 9 September 2017. Retrieved 30 January 2013. ^ Adnan, Hanim (28 March 2011). "A shot in the arm for CSPO". The Star Online. Archived from the original on 19 August 2012. Retrieved 16 October 2012. ^ Andre, Pachter (12 October 2007). "Greenpeace Opposing Neste Palm-Based Biodiesel". Epoch Times. Archived from the original on 12 November 2007. Retrieved 2 December 2007. ^ Fargione, Joseph; Hill, Jason; Tilman, David; Polasky, Stephen; Hawthorne, Peter (7 February 2008). "Land Clearing and the Biofuel Carbon Debt". Science. 319 (5867): 1235–1238. Bibcode:2008Sci...319.1235F. doi:10.1126/science.1152747. PMID 18258862. Archived from the original on 28 May 2011. ^ a b Spinks, Rosie J (17 December 2014). "Why does palm oil still dominate the supermarket shelves?". The Guardian. Archived from the original on 4 December 2016. Retrieved 7 December 2016. ^ "Oil palms need one-ninth of land used by other vegetable oil crops". Jakarta Post. 2019-02-06. Retrieved 2019-02-07. ^ Meijaard, E; et al. (2018). Oil palm and biodiversity. A situation analysis by the IUCN Oil Palm Task Force (PDF) (PDF ed.). Gland: IUCN Oil Palm Task Force. ISBN 978-2-8317-1910-8. Retrieved 2019-02-07. ^ a b c d Browne, Pete (6 November 2009). "Defining 'Sustainable' Palm Oil Production". The New York Times. Archived from the original on 12 May 2013. Retrieved 16 February 2013. ^ a b c d e Gunasegaran, P. (8 October 2011). "The beginning of the end for RSPO?". The Star Online. Archived from the original on 13 April 2013. Retrieved 16 February 2013. ^ a b c Yulisman, Linda (4 June 2011). "RSPO trademark, not much gain for growers: Gapki". The Jakarta Post. Archived from the original on 15 May 2013. Retrieved 16 February 2013. ^ Watson, Elaine (5 October 2012). "WWF: Industry should buy into GreenPalm today, or it will struggle to source fully traceable sustainable palm oil tomorrow". Foodnavigator. Archived from the original on 7 November 2012. Retrieved 22 February 2013. ^ New EU Food Labeling Rules Published (PDF). USDA Foreign Agricultural Service (Report). 12 January 2012. Archived (PDF) from the original on 16 April 2012. Retrieved 29 January 2013. ^ a b "What is Green Palm?". Green Palm. Archived from the original on 3 October 2016. Retrieved 4 October 2016. ^ a b Diet Nutrition and the Prevention of Chronic Diseases (PDF). World Health Organization (Report). 2003. p. 82,88. Archived from the original (PDF) on 2012-09-21. Retrieved 13 February 2013. ^ "The other oil spill". The Economist. 24 June 2010. Archived from the original on 9 February 2013. Retrieved 12 February 2013. ^ Bradsher, Keith (19 January 2008). "A New, Global Oil Quandary: Costly Fuel Means Costly Calories". The New York Times. Archived from the original on 1 January 2015. Retrieved 12 February 2013. ^ Mancini, A; Imperlini, E; Nigro, E; Montagnese, C; Daniele, A; Orrù, S; Buono, P (2015). "Biological and Nutritional Properties of Palm Oil and Palmitic Acid: Effects on Health". Molecules. 20 (9): 17339–61. doi:10.3390/molecules200917339. PMC 6331788. PMID 26393565. ^ a b Mozaffarian, D; Clarke, R (2009). "Quantitative effects on cardiovascular risk factors and coronary heart disease risk of replacing partially hydrogenated vegetable oils with other fats and oils" (PDF). European Journal of Clinical Nutrition. 63 Suppl 2: S22–33. doi:10.1038/sj.ejcn.1602976. PMID 19424216. ^ a b Brown, Ellie; Jacobson, Michael F. (2005). Cruel Oil: How Palm Oil Harms Health, Rainforest & Wildlife (PDF). Center for Science in the Public Interest. Washington, D.C. pp. iv, 3–5. OCLC 224985333. Archived (PDF) from the original on 6 March 2009.